Introducing the Original Personal Moisturizer with Vitamin E and aloe a new natural lubricant formulated especially for women. 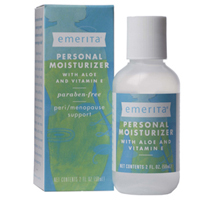 Free of mineral oil and petroleum distillates, Emerita's Natural Lubricant supports and protects the delicate vaginal balance. Emerita's Natural Lubricant contains natural ingredients blended in a water-based solution and is completely washable and non-staining. May also be used to provide vaginal moisture and help ease tampon insertion. Ginkgo promotes healthy blood flow to the brain improving mental clarity. Helps maintain proper energy, supports cardio vascular system and health.